Our fascination with vampires seemed to increase in the late 20th century with popular television series like "Buffy: the Vampire Slayer" and Stephanie Meyer's "Twilight" saga. 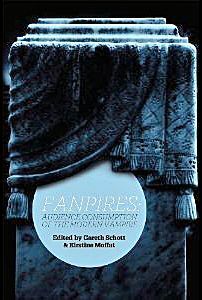 Gareth Schott and Kirstine Moffat edited a new collection of essays in a book titled "Fanpires: Audience Consumption of the Modern Vampire". Chapter Four in this book was contributed by Anita Sarkeesian, feminist pop media critic and her co-author Jennifer Jenson. Their chapter, "Buffy vs. Bella: The Re-Emergence of the Archetypal Feminine in Vampire Stories" "...explores the differences between Buffy Summers...and Bella Swan from the Twilight saga. This chapter further explores how the narratives of each fictional universe can limit or expand the way fans interact with each character." Anita Sarkeesian has generously offered a free download by visiting her website, Feminist Frequency. From Amazon.com: "This collection of essays addresses the renewed interest in the cultural resurgence of the vampire, evident across a broad range of literature, film, television, graphic novels, and games. The appeal of vampire mythology and its associated folklore for modern audiences is examined in an age characterized by the transformative possibilities of the internet with both its low barriers to artistic expression and the erosion of the boundaries between author and audience in terms of the construction of narrative, character and fictional universes. This collection examines how audiences respond to and "use" the vampire in their own practices. "From evil villains to tragic heroes, modern appropriations of the vampire, evident in popular manifestations such as the Twilight saga and the televisual adaptation of The Southern Vampire Mysteries (True Blood) are noted for their focus on the everyday. These vampires are found nested within communities, seeking to temper their urges and coexist with humans. "Drifting silently into harbour, the vampires arrived in Western Europe scarcely two centuries ago. Since then, they have become a new folklore. The rich fan cultures addressed by vibrant emerging scholars from around the English-speaking world gathered in Schott and Moffatt's collection are the true heirs of this uncanny invasion. The mix of glamour and disgust, aestheticism and dread vampires evoke offers metaphors for every form of anxiety and unholy yearning: a bloodstained laboratory for social experiment. "This collection opens new corridors into the chambers of the undead, and casts an eerie light on the subterranean worlds of fans and vampires alike." -Sean Cubitt, Professor of Global Media and Communication, Winchester School of Art, UK. "Fanpires offers the preeminent collection of scholarly approaches to this immortal shape shifter. This compilation of insightful essays not only reflects the omnipresence of the vampire in popular culture, but it identifies the pivotal role of fans in revitalizing the life of the vampire." -Wendy Haslem, Professor of Screen Studies & Cultural Management, The University of Melbourne. To retrieve Chapter Four pdf document, scroll to the bottom of Anita's blog article to this lin: "Buffy vs. Bella: The Re-Emergence of the Archetypal Feminine in Vampire Stories"
Nimoy's "In Search of Dracula"
1957 The Vampire "El Vampiro"
1969 Fangs of the Living Dead "Malenka"
Please read my Disclaimer about linked movies. Thank you! Copy and paste the above code into a blogger html gadget! "Things need not have happened to be true. Tales and dreams are the shadow-truths that will endure when mere facts are dust and ashes, and forgot." ALL THE CONTENTS OF THE BLOG, EXCEPT FOR COMMENTS, CONSTITUTE THE OPINION OF THE AUTHOR, AND THE AUTHOR ALONE; THEY DO NOT REPRESENT THE VIEWS AND OPINIONS OF THE AUTHOR’S EMPLOYERS, SUPERVISORS, NOR DO THEY REPRESENT THE VIEW OF ORGANIZATIONS, BUSINESSES OR INSTITUTIONS THE AUTHOR IS A PART OF. THE AUTHOR IS NOT A MEDICAL PROFESSIONAL, AND YOU SHOULD NEVER SUBSTITUTE INFORMATION FROM THIS BLOG FOR INFORMATION OBTAINED FROM A LICENSED MEDICAL PROFESSIONAL; ALWAYS CONSULT YOUR DOCTOR BEFORE USING ANY PRESCRIPTION, DRUGS, SUPPLEMENTS, OR UNDERGOING ANY TREATMENTS. THE CONTENT OF THIS BLOG IS NOT INTENDED TO CAUSE HARM, BUT IF YOU HAVE ANY CONCERNS ABOUT THE CONTENTS OF THIS BLOG, PLEASE CONTACT THE AUTHOR. DISAGREEING WITH THE CONTENT OF THE BLOG DOES NOT CONSTITUTE SUFFICIENT GROUND FOR YOU TO ASK THE AUTHOR TO REMOVE OR MODIFY ANY PARTS OF THIS BLOG. THE AUTHOR IS NOT BEING PAID TO WRITE CONTENT ON THIS BLOG OR TO MANAGE AND IN ANY WAY OPERATE THIS BLOG. © COPYRIGHT 2010, THEWEBOFNARCISSISM.BLOGSPOT.COM. ALL RIGHTS RESERVED.